It takes months to weave a basket this large and complex. These beautiful collectors' items are hand woven using strips of natural palm leaves which are colored with natural dyes, then wrapped around coils of wild grasses. You will receive the exact basket pictured above, woven by Jabulisiwe Mhlongo. 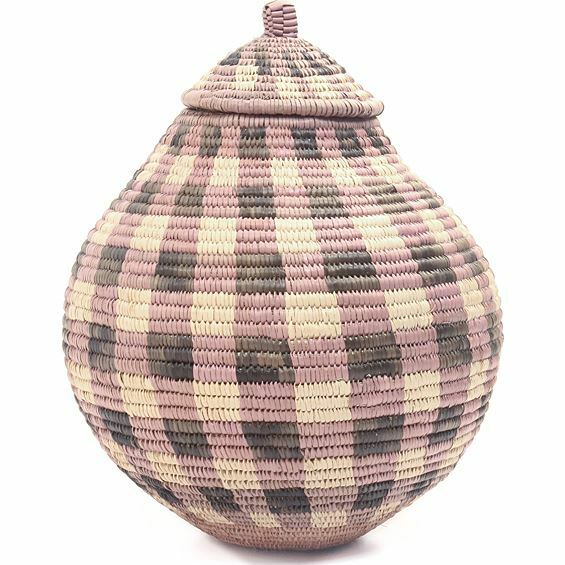 Smaller Ukhamba baskets are sometimes called "beer baskets." Baskets are still used for liquid storage in some rural areas of South Africa. Watertight baskets are readied by rubbing wet cornmeal inside. When liquid is added, the coils swell. A small amount of liquid leaks through the coils and evaporates, which cools the contents. Collection of these baskets in Zululand, South Africa is challenging to say the least. Hundreds of miles are driven on dirt roads to go village to village and hut to hut collecting baskets from each individual weaver.